I do love a good breakfast. It sets the day up and makes us feel good. Hubby is more of a morning person than I am- but even so, I love the stillness of the day and how give little tell tales of what a fresh beginning looks like. I wouldn’t call this a “everyday breakfast”. It was more of a brunch for us! Ever since I started to eat clean more frequently, we rarely have bread in the house. Pregnant though, does bring certain challenges and I find myself wanting more carbs than ever. Armed with a few additional slices of bread that is almost at the end of its life, I soaked it with some egg and panfried it. I have had pancakes with bacon and maple syrup before and thought, hey, we could do a french toast version. My new found love for fresh shitake mushrooms is probably the most healthy ingredients in this dish! 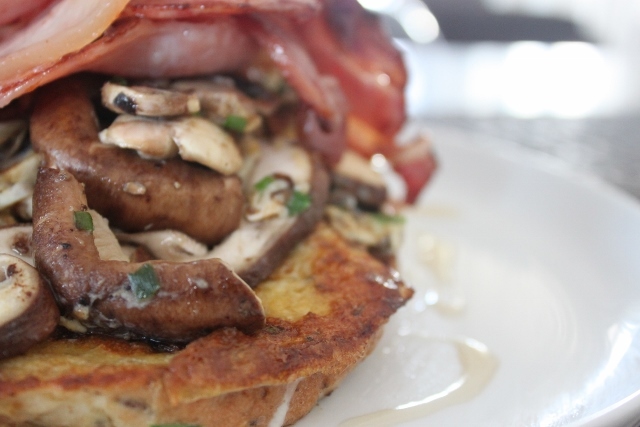 Nevertheless, the combination of french toast, grilled shitake mushrooms and a slice of bacon with a drizzle of maple syrup… it was yum! 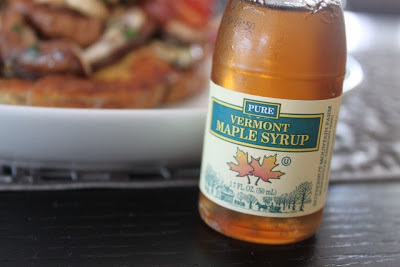 This little bottle of maple syrup was bought near the markets at Brooklyn Bridge. I said goodbye to my colleagues last friday. It probably would not be a permanent goodbye, but it invoked so many emotions in me. Sadness, relief, glad, anxiety…. It marks a change in my identity. I recall the first day of work, so full of excitement of what I can accomplish and learn and in my years of being in this organisation, I felt so blessed that I have been invited to into so many homes. Into many distraught families and in one way or another, I learned heaps from them as I work with them to have some clarity of what needs to be done next. On an organisation level, I’m walking away from beautiful colleagues who have a heart of gold and I am proud to be associated with them. Work does not define me, yet it is part of who I am. As I settled into the idea of being a mum, and dare I say it…. a domestic goddess trainee, I know that the change will be good. Plus, it gives me a chance to try out and cook up a different kind of storm in the kitchen. Whisk up eggs with almond milk and sugar. Soak bread into it. Heat pan up and melt butter. Sizzle bread on it. Meanwhile, in another pan, sauté mushrooms with butter and garlic. Toss in chives. Set aside. Sizzle bacon on it. 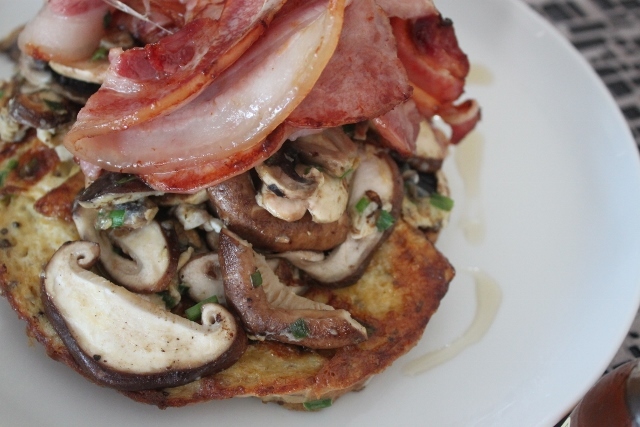 Assemble french toast, mushrooms and bacon on it. Drizzle maple syrup. Dig in! You will be full for hours! 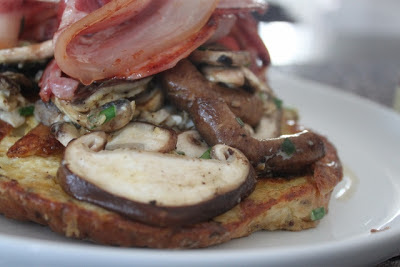 This entry was posted in Breakfast, Brunch and Breads, Not Strictly Clean, Pregnancy, Quick and Easy, Ramblings, Work. ← Happy 4th Year Wedding Anniversary! A reflection on Time – and Almond Apple Cake!